Purpose: Give you information about my services or answer your questions regarding this site. Destinatario: Gmail service. Your data will be protected by Gmail by Google security measures. Rights: You can ask me to delete any data I have about you. Do you want to hire me as redactor for texts in Spanish? If you want a budget about something specific, please send me all the information related with it such as: number of words per article, number of articles, website, etc. 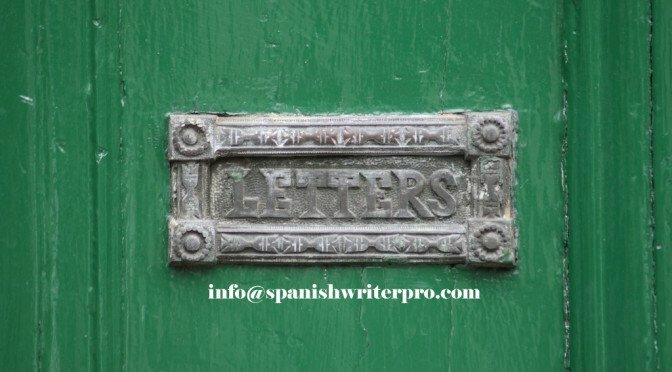 You may wan to look at my Spanish writer services where I explain the information I will need to give you an accurate budget. I also need to know whether you are a company or not. This is because the invoide will have different format to be ok with my taxes. The price for you will be the same. If you are a company in Spain, note what you need to accomplish with IRPF withholding, which will be perfectly clear in the invoice. Feel free to contact me in the same email. I am happy to get feedback, comments, ideas or anything you want to share with me. However, I am not interested in guest posts that include dofollow links to your site. Picture atributtion: creative commons licensed ( BY ) flickr photo shared by paul-simpson.org modified by me.